At 12:23 PM on May 2, 2015, the Kalamazoo area expereinced a 4.2 seismic event which was centered just east of the city of Kalamazoo and lasted less than a minute. Damage to the area was minimal but it created a great topic of conversation as neighbors compared where they were when it occured and what it felt or sounded like to them. People reported dishes rattling, chandeliers swinging, rumbling noises, and ground movement. It was a Saturday, so most tenants in the Fifth Third Building were not at work. However, our female Peregrine Falcon, Rebecca, was at home on the 13th floor when the quake hit. She was very alert and looking around more than usual shortly before the quake. At 12:23 PM, she obviously felt the quake and reacted very quickly by spreading her wings and flying out to the ledge. This was unusual because she always hops to the ledge before opening her wings. 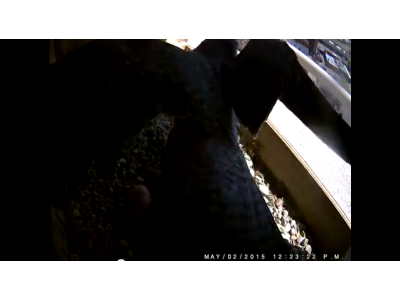 She stayed on the ledge for about 3 minutes before returning to the nest box to check the eggs and settle back into incubation. You can see the videos of this in the video archive.